Wendell's commitment to OLLI is clear, and he gets a lot in return. He often says with feeling, "A day away from OLLI is a day away from happiness." Are you a Wendell Musser groupie? If not, you may be after reading this profile. Wendell is OLLI at Duke's resident expert in Winston Churchill and Franklin Delano Roosevelt. And Eleanor Roosevelt. And Theodore Roosevelt. And the Great Depression. Since January 2005, Wendell has taught over 20 courses to over 750 students at OLLI, and his classes fill up quickly every term. After a long and distinguished medical career, Wendell joined OLLI at Duke in 2004, shortly after losing his beloved wife Nancy. Wendell brings to OLLI a deep commitment to service to others and a lifelong love of teaching. Wendell's volunteering for OLLI is not limited to his teaching. He serves as Chair of the Strategic Planning Committee and serves on the Board of Advisers at OLLI. And he and his wife Martina often show up early to OLLI events to help in whatever way they can (set up, cooking, etc). Finally, Wendell is a fixture at New Member Meet and Greet sessions, letting all who come know how important OLLI is to him. But most of us know Wendell for his classes on some of the greatest figures and events of the 20th Century: Churchill, the Roosevelts, and the Great Depression. Wendell's deep affection and appreciation of FDR started when he was just 5 years old, and his mother put a picture of FDR on one wall of their home, opposite the only other picture: of Jesus Christ. Winston Churchill crossed his path not much later, in his first speech after becoming Prime Minister on 13 May 1940. He began collecting books about these heroes once he launched his medical career. Now his library contains over 3,00 volumes, many of them first editions. His love of teaching also started early. In high school he was asked to tutor some of his fellow students who played football and basketball. One classmate was so appreciate of Wendell's help that he gave him his senior sweater and letter. Wendell continued teaching other students throughout his medical school and residency years. he recalls knowing he was born to teach when he was teaching about a medical procedure and "saw their eyes brighten" with understanding; he says "Their eyes lit up and so did mine." Wendell served his country through active duty in the military 1961-1963 and many years working with the VA System. In the early 1960s, he taught military medical corpsmen the basics of diagnosing and treating common illnesses in Southeast Asia, including inventing a kit that a corpsman could use to do laboratory tests in his helmet. 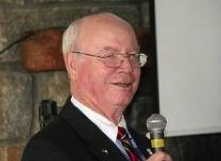 During his academic career with the VA and at 5 major universities (Indiana, Duke, George Washington, Kentucky, and Emory), Wendell especially enjoyed his interaction with young medical professionals and the opportunity to help guide them in their professional development. He takes pride in that he still hears from some of these doctors and how he helped them in their careers. After less than a year at OLLI, Wendell was asked to consider teaching a class on Churchill. In previous years he had often given after-dinner speeches and talks to high school students about Churchill and others, so he considered how he might string the speeches together into an 11-week course. Obviously, he was successful many times over. Wendell doesn't keep himself separate from his subjects: he wears his emotions on his sleeve, evidenced when he discusses FDR's polio, Eleanor's struggles as a child, and in many situations while teaching the Great Depression.